Great gift for a new baby or beautiful centerpiece for Baby Shower. 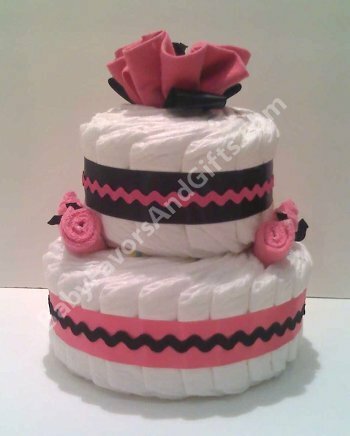 Custom made Hot Pink And Black Diaper Cake is whipped from 40 size 1-2 (up to 15lb) diapers and frosted with a Receiving Blanket, Washcloths and Ribbon. It is served in Tulle tied with beautiful premium ribbon. The 2 Tier Diaper Cake is approximately 10" round by 11" high. This diaper cake is our exclusive and can only be purchased here.